According to the latest reports from a popular research firm IDC, Xiaomi is now the Fourth largest smartphone manufacturer in the world. 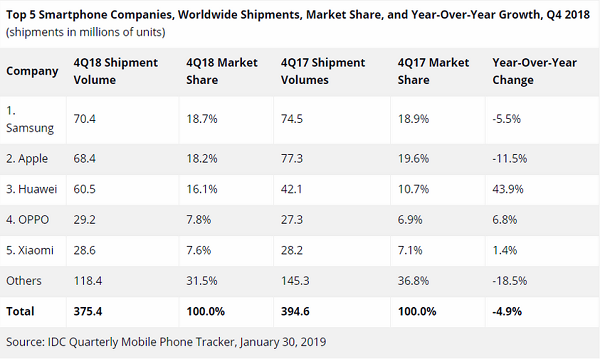 According to the report, smartphone sales declined globally in 2018. However, manufacturers like Huawei, Xiaomi and OPPO managed to increase their shipments. Well deserved for them. They’ve been churning out great devices relentlessly over time. Its only a matter of time before they get higher. I not surprised. That company is really trying. They deserve to be at the top self. I foresee the third force taking more control in the market share in the next few months. They deserve the spot they earned..
With the way infinix and tecno release useless phones Into the market, one will expect to see them at the summit of that list.